Arta Prefecture is located in the northwestern part of Greece and belongs, both geographically and administratively, to the Epirus Region, occupying its southeastern part. Its area covers 1614 sq. km (623.168 sq. mi) and it has approx. 80,000 inhabitants. It borders to the prefectures of Ioannina and Trikala to the north, Trikala, Karditsa and Aetoloakarnania to the east, to Aetoloakarnania on the south and Preveza and Ioannina on the west. A big estuary is formed within Arta Prefecture. It is actually the biggest part of the large shallow Ambracian Gulf, and it is a major pillar of the local economy. 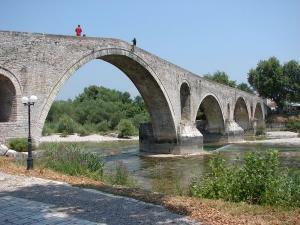 The capital city of Arta Prefecture is Arta Town, with a rich history, as you can read in our relevant article. Arta Prefecture is mostly mountainous, actually 70.4% of its area is covered with mountains (Tzoumerca-2,469m high, Kserovouni-1,614m and Ori tou Valtou-1,782m); 11% is semi-mountainous and only 18.6% cultivable plain, mainly in the Prefecture's southwestern part, near the Ambracian Gulf, where there is the plain of Arta, the largest one in Epirus. The Prefecture has a rich water supply, crossed by two rivers, Arachthos and Louros; Arachthos flows through the Prefecture and the plain of Arta covering a distance of 143 km (88.8 mi) within it. Both river Arachthos and river Louros empty into the Ambracian Gulf softening its waters and forming an very rich group of estuaries: Tsoukalio Estuary (22 sq. Km / 8.5 sq. miles) and Logarou Estuary )30 sq. Km / 11.5 sq. miles). The climate in the Prefecture ranges from Mediterranean (coastline and the plains in the south) and Continental in its interior mountainous regions. The road network of the prefecture is extensive and well organized, both in mountainous and rural regions, with negligible problems during the winter season. Tourist infrastructure is satisfactory and constantly improving: answering the needs of the visitors, the tendency is to offer a net of traditional guest houses rather than huge luxury hotels. Natural and historical sightseeing is available all over the prefecture, and the diversity of nature-loving sports and activities cannot be understated: please click Here for a classified comprehensive description of the most important cultural monuments for visitor's sightseeing or Here for a list of excursions for nature-lover's interests.